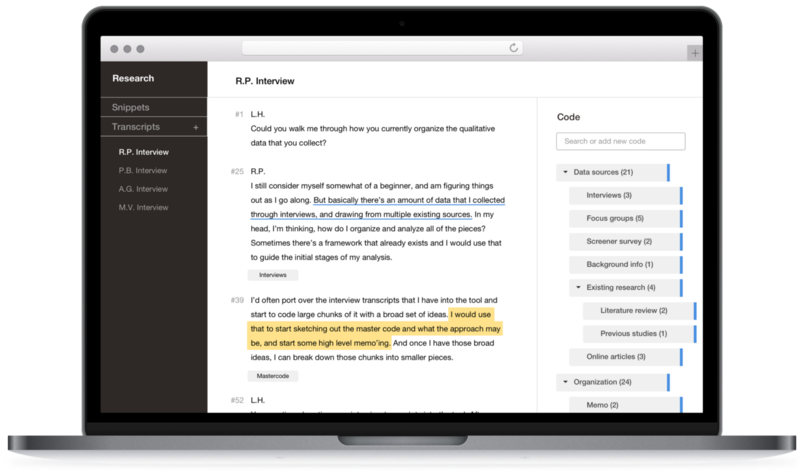 Delve is a lightweight, web-based qualitative analysis tool that enables you to analyze text such as transcripts, and filter by descriptors. We began this initiative by seeking out researchers and interviewing them about their pain points in the qualitative analysis process. We found that people were either organizing their data in very ad-hoc ways (think piles of post it notes, and coding in spreadsheets), or by using clunky and bloated interfaces (traditional CAQDAS tools like ATLAS.ti, or NVivo). Delve falls somewhere in between. More structured than the post it note process, but lighter and simpler than traditional CAQDAS tools. Here are a few things you can do with Delve. With a simple and intuitive coding interface, all you need to do is bring in the text you want to analyze and start highlighting to code sections according to themes. 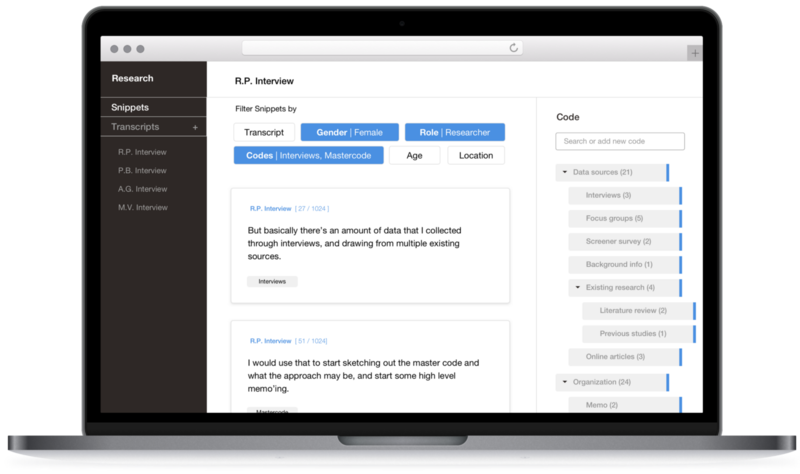 Each transcript comes with a “Participant Info” section, where you can choose your own custom inputs. You can organize your data sets according to descriptors such as gender, age, or anything that’s relevant for your research. If you want to compare how participants in different age groups felt about a particular code, use filters to sort through different sets of excerpts. We’re just getting started and are so excited to share Delve with you. In the upcoming months, we’ll be rolling this out to small groups of people at a time, and working with them to handcraft this experience to be even better. Follow @DelveTool on Twitter and Instagram, and see more information about Delve on our website.